We began filming in 1995, during the fiery protests to save public housing. We gained the trust of the residents and they began sharing their stories of a close-knit, complicated community. Our camera followed their struggle to remain, culminating in moving vans and wrecking balls. We were not done yet, nor were the residents, nor was the story that was unfolding. We continued to film. 70 Acres in Chicago is not about saving Cabrini. 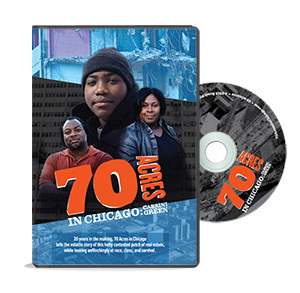 Instead, this film follows the redevelopment story over the following two decades, as families struggle with the impact of social engineering on their community and personal lives. By putting faces to the story of a mixed-income community, and documenting how people negotiate questionable political policy, the film provides a lens for analyzing the larger picture of economic and racial injustice. Yet it is the people of the Cabrini Green community that stay in sharp focus. © Ronitfilms, 2016. Website by Arlen Parsa.